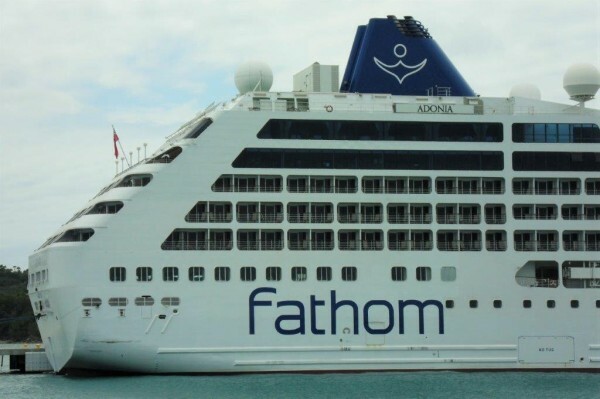 So much attention has been showered on Fathom’s historic cruises to Cuba, they have overshadowed the new company’s earlier launch of alternate cruises to the Dominican Republic which better reflect the Fathom experience. Those travelers who say they want authenticity in their travels and to have an “experience,” need look no further. Fathom is designed for them. Defining itself as travel-with-a-purpose, Fathom Impact Travel is a new kind of travel and is available as a cruise for the first time ever. Its goal is to make a significant, long-ranged “impact” on both the country visited and travelers participating with the potential of transforming lives. The name and logo emblazoned on its ship, the Adonia, serve as good descriptions of Fathom, the tenth and newest brand of Carnival Corporation. Among Fathom’s several meanings — “seeking depth” and “outstretched arms” – are found in the new line’s programs that offer depth in travel and enable passengers to become immersed in a culture, having personal experience by working alongside local people, and helping to build community with like-minded travelers for lasting impact. The Ship My cruise was the inaugural of Fathom’s seven-day cruises on the Adonia, which formerly sailed for P&O, another Carnival cruise line. She departs on alternate Sundays from Miami to Amber Cove, a new $85 million port with shops, pools and other recreational facilities, developed by Carnival Cruise Line, six miles from Puerto Plata on the north coast of the Dominican Republic. At the Port of Miami, 704-passenger Adonia docks at “J” terminal which is designated for small ship. It seems quite a distance from the terminals of Carnival and other cruise lines with large ships. Boarding was very smooth and we sailed on schedule at 4:00 pm. The ship offered a Fathom Launch/sail-away party on the top decks and some music and dancing events in the evening. Since there weren’t specific activities to attend, it was a good time for me to become familiar with the ten-deck ship. 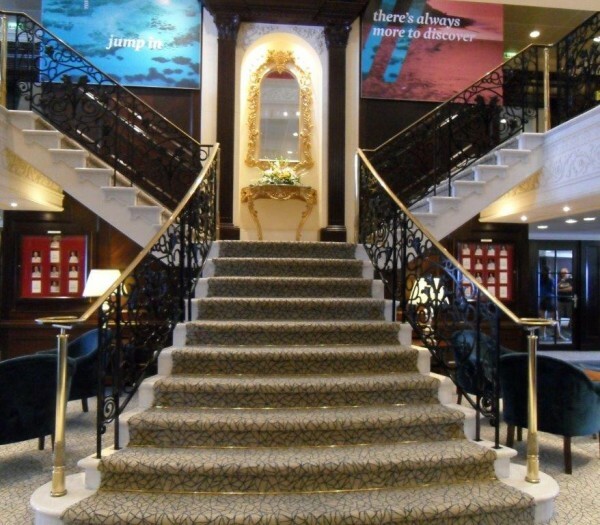 The grand staircase in Adonia’s lobby is an elegant feature easily recognized by fans of former “R” ships. Originally built in 2001, as the last of eight ‘R’ class ships for Renaissance Cruises, Adonis will feel like home to those who have sailed on the former “R” ships of Oceania or Azamara Cruises or Minerva II of Swan Hellenic. Before she entered service for Fathom, the 30,277-ton Adonis was completely refurbished with more contemporary décor while retaining her classic ambience and features like its wood paneling and grand staircase. She also has the amenities, services, spa and fitness center, and onboard activities of modern cruise ships but with the coziness and friendly charm of a small vessel. After a leisurely Sunday departure from Miami, Monday is spent at sea with a full onboard schedule of workshops by Fathom’s Impact staff (called cohorts) to introduce passengers to the programs offered during the three days the ship is docked at Amber Cove. They also included introductory Spanish and a host of games and enrichment activities for Impact passengers to get to know each other. The Fathom cohorts are enthusiastic, bilingual young men and women, who come from all over the U.S. and have been in the Peace Corp or have had similar experiences. 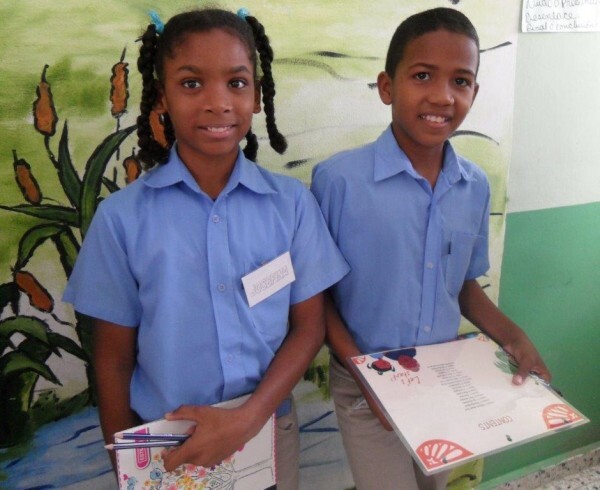 Fathom’s two years of planning for the Dominican Republic programs began by identifying as Impact partners: Two organizations, Entrena and Instituto Dominicano de Desarrollo Integral (IDDI), with long-established programs and strong social connections in the country’s northern region. In addition, Fathom consulted with local teachers, businesses and others to learn the needs of local communities. Their trained, bilingual staffs worked alongside Fathom’s Impact staff, who serve as instructors on board, and jointly, they accompany participants during Impact activities. The two years of planning and cooperation account to a great extent for Fathom’s success coming out of the gate. Fathom Impact programs fall in three groups: educational, environmental, and economic; all are designed to have either an immediate or a long-term impact or both. Suitable for a wide range of ages, skill levels and physical exertion, participants can choose from the following projects. Impact participants meet a class of young Dominican students for their first English lesson. 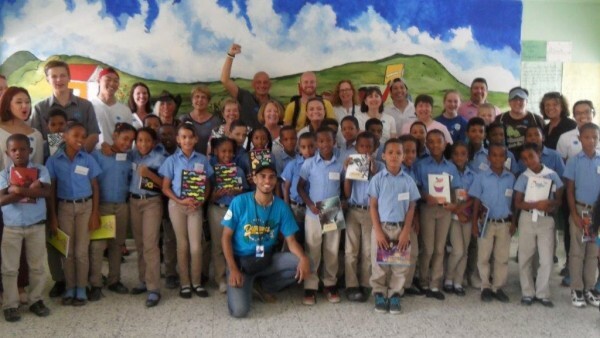 Community English Conversation (Entrena) addresses the need of the growing Dominican tourism industry for bilingual speakers by teaching English to lower income adults to help improve their employment opportunities. Small group sessions are held in community centers and homes. In addition to English instruction and one-on-one conversation, participants enjoy preparing food and sharing a meal. Another option, offered in summer only, is Creative Arts, Music, and Sports (Entrena), an innovative three-day camp designed to develop children’s creativity, athletic ability, and life skills. Located in a mountain community above Puerto Plata, Impact participants help to create videos, drama presentations, hands-on arts and crafts, and sports. ENVIRONMENTAL IMPACT Water Filter Production (Entrena) recognizes that three million Dominicans have no access to piped water. Working alongside local artisans, Impact participants assist in the filter-making process from mixing the raw materials, working and shaping the clay to firing and testing them, and distributing the clay filters to needy families. Reforestation and Nursery (IDDI) In areas near mountain villages, effort is being made to restore degraded land, frequently washed away by heavy rain and landslides. The result is to improve the livelihoods of Dominican families, as well as contribute to forest and wildlife conservation in the region. Working with small local groups, participants learn firsthand to pot tree seedlings, assist in establishing and managing tree nurseries, transporting plants, and hiking to mountain sites to plant the tiny trees. 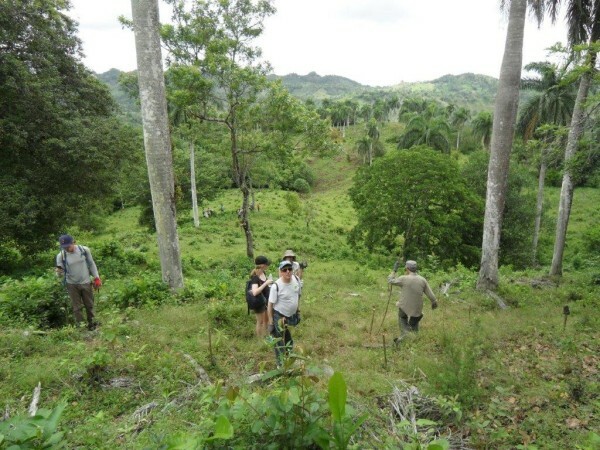 Impact groups hike to degraded mountain sites where stakes mark the places for planting seedlings. ECONOMIC DEVELOPMENT IMPACT: Cacao and Women’s Chocolate Cooperative (IDDI) A local women’s cooperative cultivates organic cacao (chocolate) plants, an important source of income for the Puerto Plata region. Impact participants assist in the complete production cycle — from planting and cultivating cacao trees, to preparing the raw materials and producing and packaging the final product of organic artisan chocolates for sale. The goal, by helping to increase production, is to increase sales, thus enabling the cooperative to hire more women, who can gain income in a region where employment opportunities are limited. 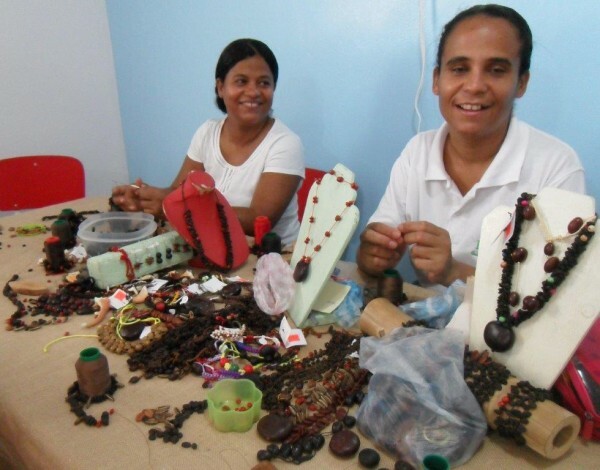 Recycled Paper and Crafts Entrepreneurship (IDDI) Another group of Dominican women with IDDI support formed RePapel, an association to recycle paper and create products to sell. Impact participants assist in the six-step process of paper recycling and help make eco-friendly products for sale from the recycled paper and local natural fibers, seeds and shells, such as jewelry, candles and coasters. UNUSUAL IMPACT OPPORTUNITIES: Concrete Floors in Community Homes (IDDI) In a country where forty percent of the population lives below the poverty line, and the average household annual income is less than US$6,000, it is not uncommon for homes in impoverished communities to have dirt floors — a genuine health risk — as they can be dusty during the dry season and damp and wet in the rainy season — and, impossible to clean. The Impact goal is to help improve the health of Dominicans living in these homes. Different small areas are selected where houses are upgraded with concrete floors. Because not all participants are able to pour concrete, other tasks are available to be done, such as painting, improving the home’s surroundings, and planting fruit trees for their beauty and long-term nutritional benefits. Impact participants work alongside homeowners and community members, including children. Fathom cruises are not meant to be all work and no play. On board, passengers can choose from a variety of diversions from yoga and meditation to dominos. On shore, the ship offers city tours, deep sea fishing, sailing and snorkeling, zipling and beach excursions or they might enjoy the sports facilities at Amber Cove. What sets Fathom apart from most volunteer-travel opportunities is that the latter are usually for only one or two weeks’ duration, once a year. Fathom’s programs are long-term with a sustained commitment and cooperation with local partners who are already deeply involved in the Impact activities that the cruises offer. Fathom is banking on the accumulative effect of its efforts. Anticipating that by bringing up to 700 passengers every other week to work on Fathom projects — with each new group picking up where the last group left off — the impact can be measured after six month or a year. Adjustments can be made as needed, and new projects added. One of the workshops I attended on the full day at sea en route to the DR was for those enrolled to teach English to Dominican students. We were shown an excellent, richly illustrated teaching manual prepared by Fathom but it was too extensive for us to absorb in one day. However, Fathom plans to send in advance material to passengers who sign up for the program to give them a head start. The next day, we took a short bus ride from Amber Cove to the school we would be visiting in the Puerto Plata suburb of San Marcos. The building housing the school was previously a sugar mill and donated by Brugal, one of the DR’s leading rum makers. Its founder, Ing. George Arzeno Brugal, created a foundation of semi-private/public schools for poor children, Fey y Alegaria (Faith and Happiness) which has 48 schools in the Dominican Republic and Latin America. Our school had 640 students, ages 7 to 14, and three levels of instruction with two classes for each level in the building housing 20 classrooms. Dominican children in the language program. After a quick tour of the school, its library and cafeteria, we had a short pep rally to introduce us and to help break the ice with the kids who looked at us with eyes of wonder as though we had come from another planet. [Note: We were the first Fathom group these children had ever encountered.] We were broken up into small groups, each to teach two or three students who knew no English. In a 45 minute session we covered basic phrases like, What’s your name? and basic words from the Teaching Guide along with colorful cards printed with an English word or phrase on one side and in Spanish on the other. After a short break for simple refreshments, we went to a different class and again, were teamed up with two or three students. Clearly, the students and their teachers were pleased to see us. Since we were the first to launch the program, we probably learned more Spanish than the children learned English. But after a year, when Fathom has brought up to 700 passengers every other week to the DR and participants teach students – picking up from the Teaching Guide where the last group left off – the effort is bound to make an impact Hopefully, over time, the students will learn enough English to land good jobs where a knowledge of the language is required. What at first blush seems like pie-in-the-sky, when passengers experienced any of the Impact programs in action, they became convinced. At sessions later on board, passengers expressed their joy and how much the experience had meant to them. Even the most skeptical – myself included – were converted. Credit goes to the Fathom organization and its Dominican partners for being so well prepared. Their two years of planning is paying off. Regarding the Cuba cruises, unlike in the Dominican Republic ones, where travelers work side by side with local people on existing programs aimed at improving the lives of families and communities, in Cuba, passengers participate in cultural exchange programs approved by the Cuban government. Although Fathom would like have programs in Cuba similar to those in the DR, it may be a long time before the Cuba government would sanction such activity. Cuba itineraries start at $1,889 per person. Kay Showker was destined to be a travel and cruise writer, having taken her first trans-Atlantic voyage at age two. Over the intervening years, she has visited 120 destinations around the world and authored 15 guidebooks. Following a 10-year tenure as an editor and travel journalist at Travel Weekly, a major U.S. travel trade publications, Showker became a freelance writer/photographer. In addition to guidebooks, she wrote AOL’s Cruise Critic/Caribbean for three years, andhas appeared as a travel expert on CNN, ABC, CBS, NBC, and The Travel Channel. Showker’s newest publication is her first e-book, Jamaica – Naturally, A Guide for Today’s Active Travelers, and the first of a series, The Caribbean – Naturally, Island Guides for Active Travelers, which she is writing. I had heard of this and was curious so I was happy to see you covered the Fathom experience. Thank you for this detailed and trusted report.